It's been hard to find the time to blog lately. That's not a complaint, necessarily, just the way it is, with long full-time hours at Folkways along with frequent trips to North Carolina and other travel, all while trying to squeeze in other personal projects. When I do have the time through, I'm compelled to go about the aspects of posting in a more deliberate way, trying a new photo set-up, filling gaps in my recipe catalog so I'm covering the classics, but also writing about more unusual regional and historical recipes. These are pies and other desserts that may have faded with the rise and fall of baking trends, or are in desperate need of recontextualization as their story and the people attached has become glossed over, simplified, or stereotyped. This is something that happens often with recipes from the south and other rural places. I've also committed myself to shooting more film again-- for the blog and just in general. I've been really inspired by the past couple of rolls I shot on my dad's old Nikon F. The camera and the macro lens just capture light in a way that digital can never achieve with its more flattened, even algorithm. Zeke compared it to analog tape, and that sounds right-- with film, what's in focus is completely clear, ringing out over the more gestural, fuzzy background. I spent Memorial Day weekend at home-- a good three days to catch up on things, make a lot of food, take a lot of photos, and even work in a trip to the pool with friends. 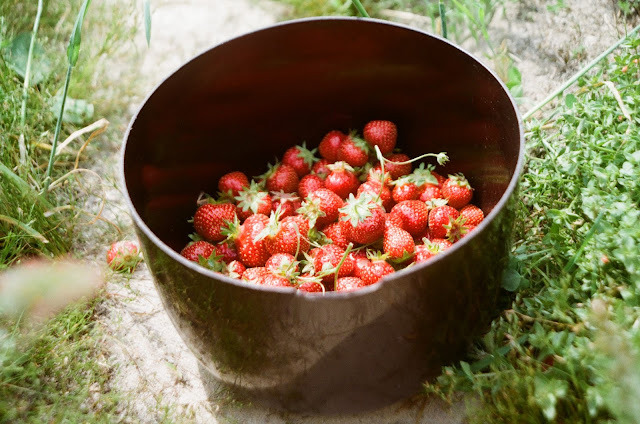 The weekend prior, Zeke and I picked 13 pounds of strawberries at Whitted Bowers Farm in Cedar Grove, North Carolina-- an organic, biodynamic U-pick patch with the sweetest, most flavorful berries I've ever tasted. I went a little crazy processing them-- pickling, freezing, baking, infusing them in vodka and putting them in ice cream (some details of such coming to the blog). A coworker also gifted me some rhubarb, so a Strawberry Rhubarb Pie was most definitely in order. 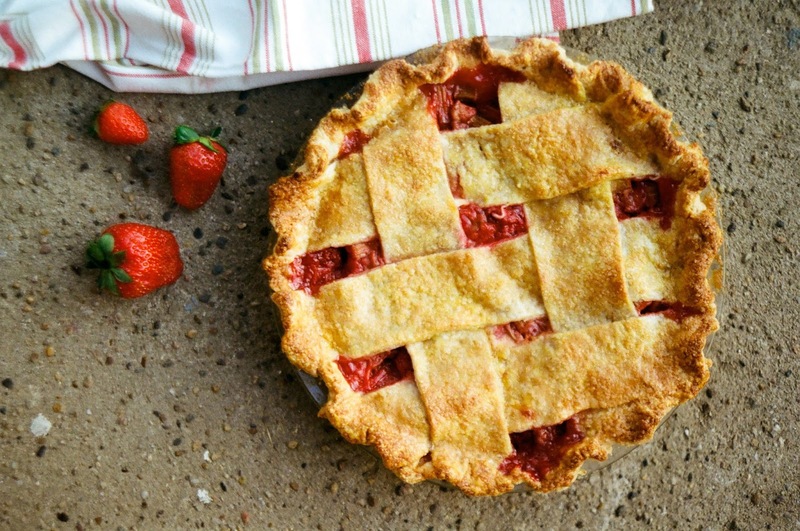 I browsed a number of recipes, settling on Nancie McDermott's from her crucial resource Southern Pies, due to it's higher ratio of rhubarb to strawberries. I'm a huge fan of rhubarb, and in my book, the best berry-rhubarb pies don't mask the rhubarb flavor, but enhance it. The strawberries were so sweet so I cut back on the sugar, and were small enough to leave them whole. This was hands down one of the best pies I've ever made, the flavor so brilliantly forward, the filling so red. 1. Prepare pie crust as per the directions here. Refrigerate dough for approximately 1 hour. Once chilled, roll out 1/2 of pie crust and fit into a 9-inch greased and floured pie pan. Return crust to the fridge while you prepare the lattice & filling. 2. Preheat oven to 425 F. In a large bowl, combine sugar, flour, cinnamon, and salt, using a whisk or fork. 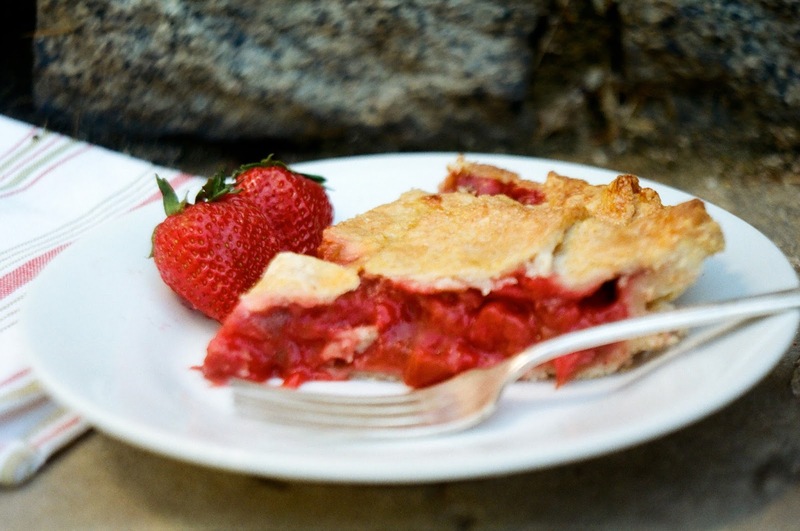 Add rhubarb, strawberries, and stir together gently with a wooden spoon. Pour mixture into pie crust. 3. To make the lattice: Roll out remaining dough into a long rectangle. 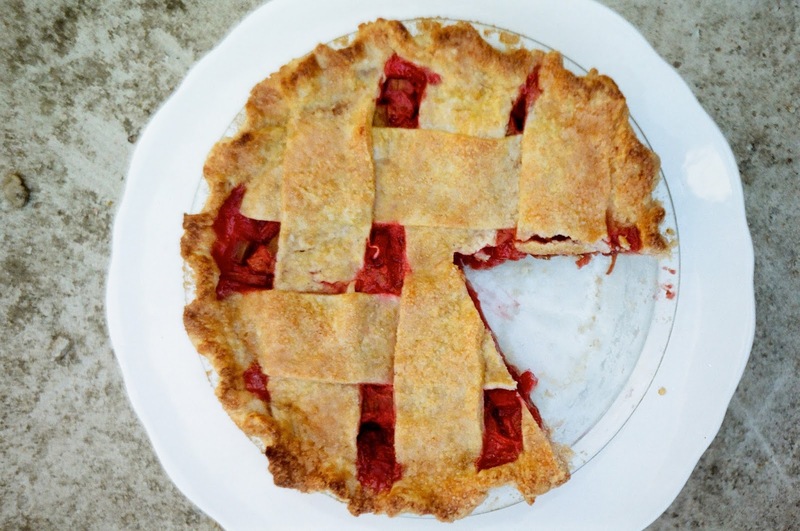 Using a ruler as a guide, use a knife or pastry wheel to cut strips of equal width for the lattice top. Lay strips parallel across the pie and fold back every other strip. Weave the same number of strips perpendicular to the first strips, alternating over and under. Trim strips so that they leave a 1-inch overhang. Fold bottom crust over the lattice and tuck the excess under. Seal and flute edges decoratively. 4. Brush lattice with egg wash and dust with Turbinado sugar. 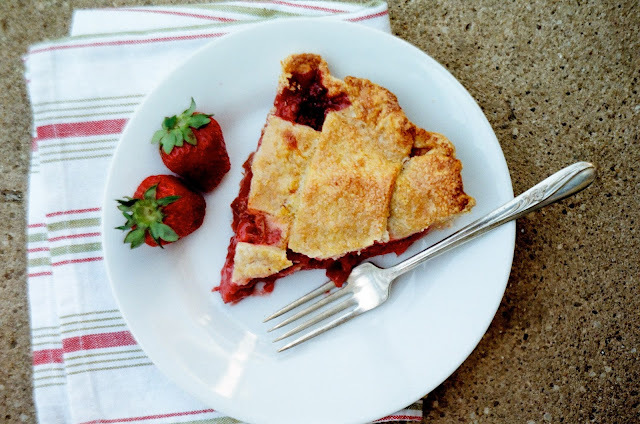 Place pie on baking sheet and bake for 15 minutes, then lower temperature to 350 degrees F and bake until filling bubbles and crust is golden brown, 45-50 minutes more. 5. Place pie on cooling wrack and let cool for at least 30 minutes. Serve warm or at room temperature. Labels: film, North Carolina, rhubarb pie, strawberry pie, strawberry rhubarb pie, Washington D.C.
Hi! I love your blog! 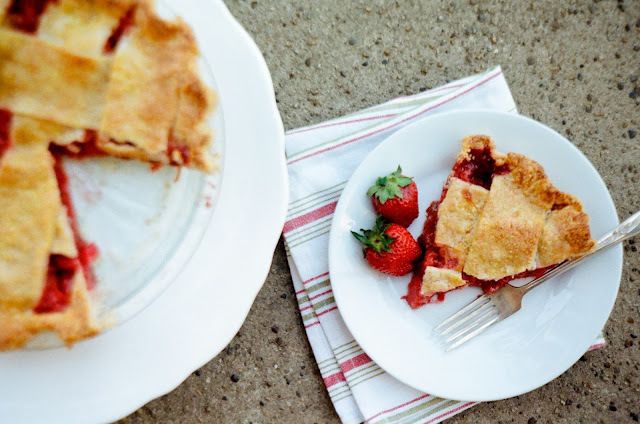 I used a different recipe for a strawberry rhubarb pie a few days ago and it's just too sweet (and also a bit runny). I want to try this one. I froze the extra rhubarb I had in small pieces. Do I use frozen rhubarb the same as fresh? Or will it have more liquid when it bakes? 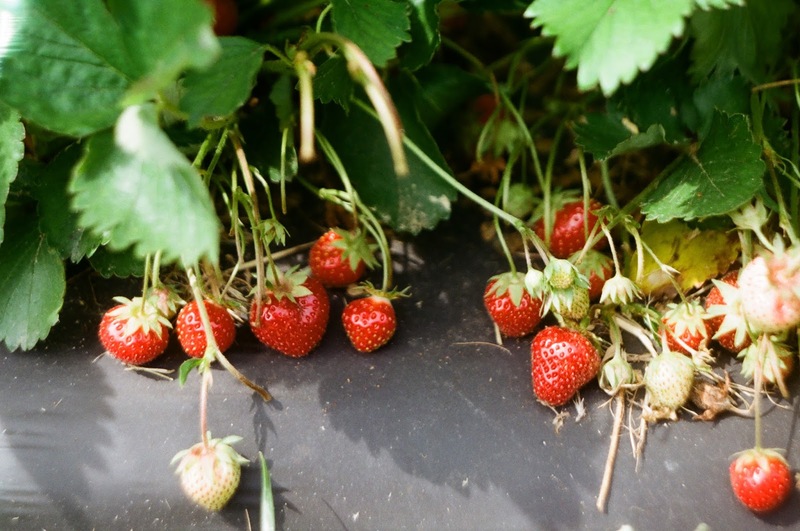 Also, we've picked some delicious strawberries and have them in the freezer. Is it best to use fresh strawberries or will frozen also work? Thank you in advance! Hi Julie! Apologies for the late reply. I've never worked with frozen rhubarb, but from what I've read, you can use it the same as fresh. Don't thaw it before baking and it shouldn't create more liquid. As for strawberries, I think fresh is always best, but you can use frozen if you need to. Good luck and let me know how it goes!